Cytora, a U.K. startup that had developed an AI-powered solution for commercial insurance underwriting, has raised £25 million in a Series B round. Leading the investment is EQT Ventures, with participation from existing investors Cambridge Innovation Capital, Parkwalk, and a number of unnamed angel investors. A spin out of the University of Cambridge, Cytora was founded in 2014 by Richard Hartley, Aeneas Wiener, Joshua Wallace, and Andrzej Czapiewski — although both Wallace and Czapiewski have since departed. Its first product launched in late 2016 to a number of large insurance customers, with the aim of applying AI to commercial insurance supported by various public and proprietary data. This includes property construction features, company financials, and local weather, combined with an insurance company’s own internal risk data. “Commercial insurance underwriting is inaccurate and inefficient,” says Cytora co-founder and CEO Richard Hartley. “It's inaccurate because underwriting decisions are made using sparse and outdated information. It's inefficient because the underwriting process is so manual. Unlike buying car or travel insurance, which can be purchased in minutes, buying business insurance can take up to seven days. This means operating costs for insurers are extremely high and customer experience isn't good leading to a lack of trust”. To illustrate how inefficient commercial insurance can be, Hartley says that for every £1 of premium that businesses pay to insurers, only 60 pence is set aside to pay total claims. The other 40 pence evaporates as the “frictional cost of delivering insurance”. Powered by AI, Hartley claims that Cytora is able to distil the seven day underwriting process down to 30 seconds via its API. This enables insurers to underwrite programmatically and build workflows that provide faster and more accurate decisions. “Our APIs are powered by a risk engine which learns the subtle patterns of good and bad risks over time,” he explains. “This gives insurers a better understanding of the underlying risk of each business and helps them set a more accurate price. Both customers and insurers benefit”. Typical Cytora customers are commercial insurers that are digitally transforming their underwriting process. Users of the software are either underwriters within insurance companies who are underwriting large commercial risks (ie an average insurance premium ~£500k and above) or business customers of insurance companies who are buying insurance direct online with an average premium of £1,000-£5,000. “For the latter, our customers have built quotation workflows on top of Cytora's APIs, enabling business owners to buy policies online in less than a minute without having to fill in a form,” says Hartley. “We require only a business name and postcode to issue a quote, which revolutionises the customer experience”. To that end, Cytora generates revenue by charging a yearly ARR license fee which increases based on usage and per line of business. The company says today’s Series B funding will be used to accelerate the expansion of its product suite and for scaling into new geographies. "We are on our way to a carbon free future mobility. While our all-new EQC model enters the markets this year we are already preparing the way for the next generation of powerful battery electric vehicles,” said Sajjad Khan, executive vice president for Connected, Autonomous, Shared & Electric Mobility, Daimler AG in a statement. "Advancements in lithium-ion batteries have become increasingly limited, and we are fighting for incremental improvements," said Immelt. "I've seen first-hand that this is a huge opportunity that is also incredibly hard to solve. 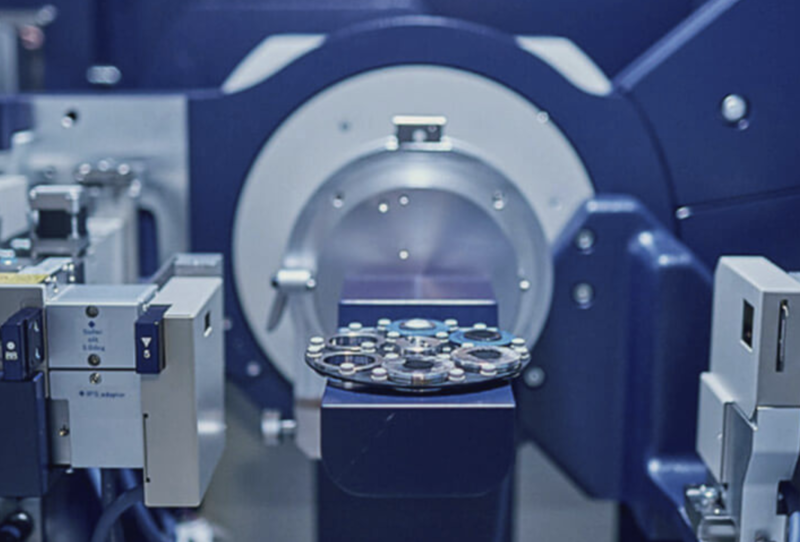 The team at Sila Nano has not only created a breakthrough chemistry, but solved it in a way that is commercially viable at scale." No, you’re not misremembering the details from that young adult dystopian fiction you’re reading — Facebook really does sell a video chat camera adept at tracking the faces of you and your loved ones. Now, you too can own Facebook’s poorly timed foray into social hardware for the low, low price of $99. That’s a pretty big price drop considering that the Portal, introduced less than six months ago, debuted at $199. Unfortunately for whoever toiled away on Facebook’s hardware experiment, the device launched into an extremely Facebook-averse, notably privacy-conscious market. Those are pretty serious headwinds. Of course, plenty of regular users aren’t concerned about privacy — but they certainly should be. As we found in our review, Facebook’s Portal is actually a pretty competent device with some thoughtful design touches. Still, that doesn’t really offset the unsettling idea of inviting a company notorious for disregarding user privacy into your home, the most intimate setting of all. Facebook’s premium Portal+ with a larger, rotating 1080p screen is still priced at $349 when purchased individually, but if you buy a Portal+ with at least one other Portal, it looks like you can pick it up for $249. Facebook advertised the Portal discount for Mother’s Day and the sale ends on May 12. We reached out to the company to ask how sales were faring and if the holiday discounts would stick around for longer; we’ll update when we hear back. Discs! What are they good for? Well, they’re nice if you don’t want to be tied to an online-only ecosystem. But if you don’t mind that, Microsoft’s latest Xbox One S “All-Digital Edition” might be for you. With no slots to speak of, the console is limited to downloading games to its drive — which is how we’ve been doing it on PC for quite some time. Announced during today’s “Inside Xbox” video presentation, the Xbox One S All-Digital Edition — honestly, why not just give it a different letter? — is identical to the existing One S except for, of course, not having a disc slot in the front. The impact of the news was lessened somewhat by Sony’s strategically timed tease of its next-generation console, revealing little — but enough to get gamers talking on a day Microsoft would have preferred was about its game ecosystem. But to return to the disc-free Xbox. The CPU and GPU are the same, RAM is the same, everything is the same. Even, unfortunately, the hard drive: a single lonely terabyte (imagine saying that a few years ago) that could fill up fast if every game has to be downloaded in full rather than loaded from disc. At $249 it’s $50 cheaper than the disc-using edition, and comes with copies of Sea of Thieves, Minecraft and Forza Horizon 3. That’s a pretty decent value, I’d say. If you’re looking to break into the Xbox ecosystem and don’t want to clutter your place with a bunch of discs and cases, this is a nice option. Sea of Thieves had kind of a weak start but has grown quite a bit, FH3 is supposed to be solid and Minecraft is of course Minecraft. You can pre-order the All-Digital Edition (which really should have been called the Xbox One D) now, and it should ship and be available at retailers starting May 7. Victor Basta is the founder of the boutique investment firm Magister Advisors. If you're hoping to create a unicorn on a budget, look to the European technology sector for inspiration. Despite the well-documented increase in available funding for tech companies across the continent, startups are reaching unicorn status with much lower totals of venture capital than U.S. rivals. In fact, this level of "capital efficiency" is one major attraction for international investors weary of the "burn rate" of many U.S. companies aspiring to valuations of $1 billion+. It costs a staggering 50-100 percent more in the U.S. to create a company valued at $1 billion than in Europe. For U.S. tech companies that achieved unicorn status in 2018, the median amount of funding required was more than $125 million, whereas their contemporaries in Europe required a lesser total of $80 million. For 2017, the gap was even wider; U.S. companies again required just over $100 million, the smaller pool of Europeans slightly above $50 million. A key reason for this greater efficiency in scaling is because European companies have had to make do with less. Europe has historically had a much smaller pool of "late-stage growth" funding (typically rounds of $30-75 million), and even today it is far easier to raise $20 million for a European tech company than $50 million, while that does not hold true in the U.S. to anywhere near the same degree. This dearth of late-stage money has forced European tech companies to scale more efficiently, with lower overheads and a focus on profitability at an earlier stage, rather than the aggressive growth patterns often witnessed in the U.S. But this "enforced prudence" has come at a price. Greater capital efficiency has arguably resulted in fewer European tech companies achieving unicorn status, with Europe lagging far behind the number created each year in the U.S. In 2018, the U.S. birthed 53 unicorns; Europe, only 10. So how much funding is required to close the gap? Let’s assume (safely) product innovation and quality is available both in the U.S. and Europe, and let's assume (less safely) there are many more quality European companies built to "unicorn potential" that are currently unable to raise enough to fuel scale to the point where they achieve $1 billion valuations. To plug this funding gap, we estimate Europe would require a multi-year capital pool of $10-20 billion in additional late-stage capital. That math is based on a large number, up to 40, of companies a year missing out on becoming unicorns because of a lack of available funding, alongside the assumption that each unicorn needs more than $100 million in funding in total. The extremely good news is that it is not $100 billion. Due to the inherent efficiency of risk capital, $10-20 billion can go an awfully long way. Arguably, there is no other industry or sector that can yield such a high return on committed money within a reasonably short few years. No, Europe is still a trickier market to scale than the U.S. Not only does Europe have to compete with the ready availability of capital in the U.S., but different regulatory environments, language barriers and a brain drain of talent attracted to Silicon Valley all combine to create impediments for European tech companies scaling in an interconnected world. Funding, however, stands as the simplest of limiting factors to address. Especially when an analysis of the stats shows that whilst European tech companies are "saving" a lot of money, this directly contributes to far fewer of them being worth the mythical $1 billion+. A marginal uplift in capital would produce a disproportionately higher number of unicorns. Netflix just released its earnings letter for the first quarter of 2019. The company says it saw growth of 9.6 million paying subscribers, up 16 percent year-over-year. That’s significantly ahead of the 8.9 million new subscribers that analysts had predicted. On the financial side, the quarter came in right at expectations, with revenue of $4.5 billion and earnings per share of 76 cents. Netflix says it now has 148.9 million paid streaming memberships. Most of this growth (7.9 million of the net additions in Q1) is happening internationally. Things aren’t looking quite as strong in Q2, with Netflix forecasting 5 million net additions, which would be 8 percent lower than growth during the same period in 2018. As of 4:36pm Eastern, Netflix shares are down about 1.8 percent in after-hours trading, presumably in response to that Q2 forecast. This comes as Netflix is rolling out significant price hikes in the United States, Brazil, Mexico and parts of Europe. “The response in the US so far is as we expected and is tracking similarly to what we saw in Canada following our Q4'18 increase, where our gross additions are unaffected, and we see some modest short-term churn effect as members consent to the price change,” the company says. It says “The Umbrella Academy” was viewed by 45 million member households during its first four weeks on the service, “Triple Frontier” was viewed by 52 million households and “The Highwayman” is on-track to be watched by more than 40 million households. On the nonfiction side, the service’s Fyre Festival documentary was viewed by more than 20 million households. And of course, Netflix also faces increasing competition, with Apple and Disney both revealing more details about their upcoming streaming services in recent weeks. Both companies are world class consumer brands and we're excited to compete; the clear beneficiaries will be content creators and consumers who will reap the rewards of many companies vying to provide a great video experience for audiences. We don't anticipate that these new entrants will materially affect our growth because the transition from linear to on demand entertainment is so massive ​and because of the differing nature of our content offerings​. Developers building voice-enabled applications for Amazon Echo and other Alexa-powered devices will now have a new way to validate their abilities, with Amazon’s launch of a new AWS Certified Alexa Skill Builder – Specialty certification. This is the first time Amazon has offered a certification program for Alexa developers, the company says. The new Alexa certification will be a specialty within the AWS program, and will validate those with an understanding of all aspects of Alexa voice app development. This includes the more practical matters — like how to develop, test, validate and troubleshoot skills, the use of the Alexa Developer Console, how to manage skill operations and life cycles, and more. But it will also get into more high-level concepts, like the “value of voice” and how a voice user experience should flow — something that many Alexa developers today still seem to struggle with. To get started, developers can review a new exam guide, which helps them learn about Alexa skill building through tutorials, technical documentation and more. Amazon is also making self-paced training courses available online. When ready, developers aiming to get certified can create an AWS Training account and schedule their exam. “The demand from organizations for skilled professionals who can build skills for emerging voice-enabled workloads is increasing," says Kevin Kelly, director, AWS Certification and Education Programs, in a statement. "This new certification validates those skills with the only credential in the industry focused on Alexa skill building,” he added. After eight years of teasing a folding device, Samsung finally pulled the trigger with an announcement at its developer's conference late last year. But the device itself remained mysterious. Video app TikTok has become a global success, but it stumbled hard in one of the world's biggest mobile markets, India, over illicit content. “More relevance means less time on the service, and that's perfectly fine,” Dorsey said, adding that Twitter can still serve ads against relevant content. KZen is about to release ZenGo, a mobile app to manage your cryptocurrencies securely and more easily. There are already countless crypto wallets out there, but the startup thinks they're all either too complicated or too insecure. If you own cryptocurrencies, chances are they're sitting on an exchange, such as Coinbase or Binance. If somebody manages to log in to your account, nothing is stopping them from sending those assets to other wallets and stealing everything. Worse, if somebody hacks an exchange, they could potentially divert cryptocurrencies from that exchange's wallets. In other words, leaving your cryptocurrencies on an exchange means you give your assets to that exchange and hope they properly take care of them. Vitalik Buterin: "I definitely hope centralized exchanges go burn in hell as much as possible"
On the other end of the spectrum, you can manage your private keys yourself and rely on a hardware wallet from Ledger and Trezor. The learning curve is too hard for many people. And if you don't follow instructions properly, you might end up losing access to your wallet or accidentally sharing private keys. Enough about other wallets, let's talk about ZenGo. 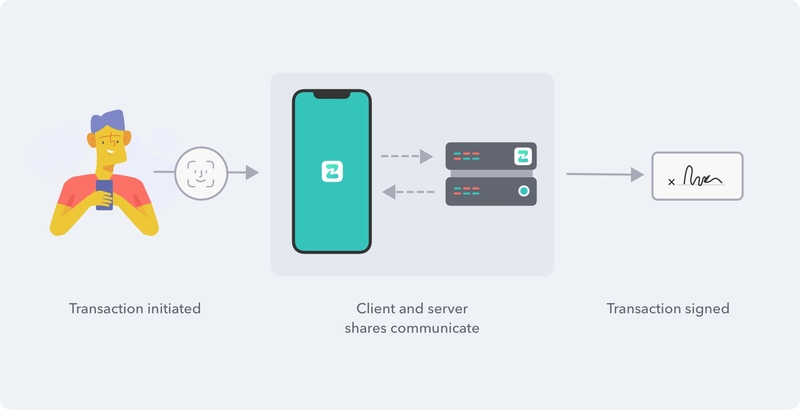 Former TechCrunch editor Ouriel Ohayon and his team think the perfect wallet app involves a smartphone you own paired with ZenGo's servers. 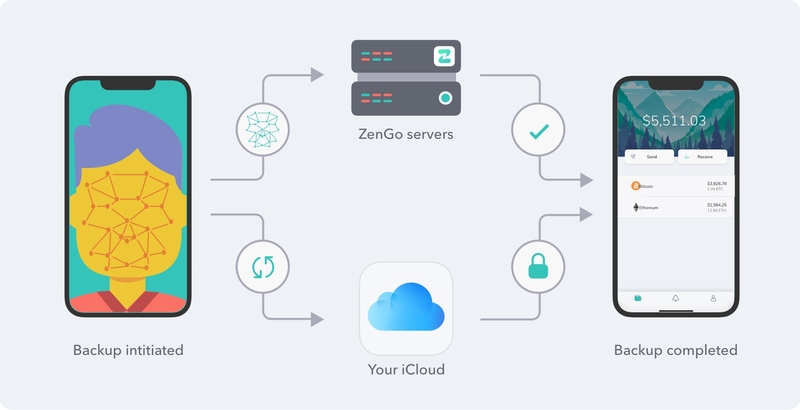 The company uses threshold signatures, which means that you need both ZenGo's servers and your smartphone to initiate a transaction. If you lose your device, you can recover your funds. But the startup can't access your cryptocurrencies on its own. When you set up your wallet, two private secrets are generated separately and stored in multiple ways — one part is on your smartphone, the other is on the servers. You need both parts to sign a transaction. If you back up your device part to ZenGo's servers, you can recover all parts in case you lose your device, for instance. ZenGo can't directly access the second part on its own because it is encrypted using a decryption code that is stored on your iCloud account. But accessing your iCloud is not enough — if you want to recover your wallet, you need to prove your identity. That's why the company stores a 3D biometric face map to let you restore your wallet on a new device. The company partners with ZoOm so that you can create a face map from any smartphone with a selfie camera. The security model has been open-sourced and I hope many security experts will try to find vulnerabilities. That's the only way you can know for sure that it's a secure system. All of this sounds complicated, but most users won't even realize what's happening. I tried the app and it's a well-designed mobile app. 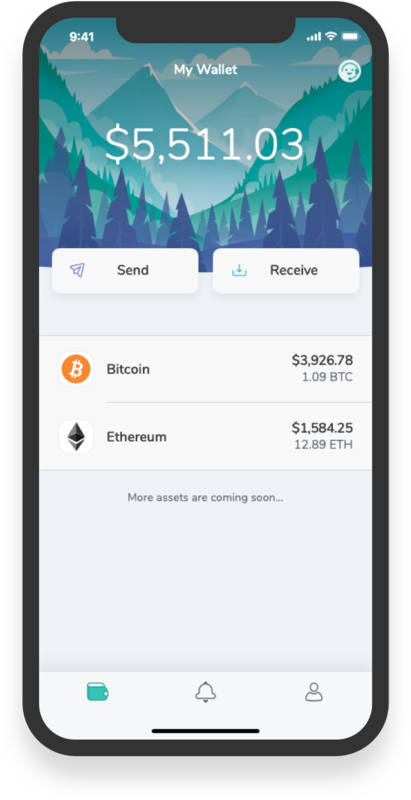 Right now, it only supports Bitcoin and Ethereum, but more assets are on the way. The company tracks your public addresses to notify you when you receive funds. The app isn't available just yet. It should launch as a beta this week and arrive in the stores pretty soon. Logitech has a long history of serving AV nerds with its advanced line of universal remotes. In an age of eight million set-top boxes, dongles and video-on-demand services, the Harmony line has done a good job streamlining users' needs into a single device. As the name suggests, the Harmony Express isn't designed for as serious a crowd as its predecessors. In fact, the new remote skips the more advanced stuff like touchscreens in order to let Alexa do the heavy lifting. Amazon's smart assistant can be used to perform your standard array of tasks, like turning devices on and off, launching apps and going to specific channels. You also can do all of the regular non-remote Alexa stuff, like listening to news and controlling smart home devices. There's a built-in mic and speaker, so you can converse with the assistant. It's a bit of a gamble. You never really know how much you're going to want to use your voice to control a set until you actually try it. In fact, it's a pretty minimalist product. Aside from the large Alexa button up top, there are a total of nine buttons on the device. That's not a lot when it comes to all of the things it's programmed to control. It's also $250, which will make it an even harder sell as the company attempts to triangulate the target audience for the device. Certainly it's good news for Amazon, in its quest to put Alexa on everything. Here's Alexa VP Pete Thompson: "We're thrilled to see Logitech simplifying the home theater experience by bringing the convenience of Alexa to its Harmony Express remote. With Alexa built-in, you can easily search and navigate content, control smart devices, access thousands of skills, and more – all you need is your voice." With its Kubernetes Engine (GKE), Google Cloud has long offered a managed service for running containers on its platform. Kubernetes users tend to have a variety of needs, but so far, Google only offered a single tier of GKE that wasn’t necessarily geared toward the high-end enterprise users the company is trying to woo. Today, however, the company announced a new advanced edition of GKE that introduces a number of new features and an enhanced financially backed SLA, additional security tools and new automation features. You can think of GKE Advanced as the enterprise version of GKE. The new service will launch in the second quarter of the year and hasn’t yet announced pricing. The regular version of GKE is now called GKE Standard. Google says the service builds upon the company’s own learnings from running a complex container infrastructure internally for years. For enterprise customers, the financially backed SLA is surely a nice bonus. The promise here is 99.95 percent guaranteed availability for regional clusters. Most users who opt for a managed Kubernetes environment do so because they don’t want to deal with the hassle of managing these clusters themselves. With GKE Standard, there’s still some work to be done with regard to scaling the clusters. Because of this, GKE Advanced includes a Vertical Pod Autoscaler that keeps on eye on resource utilization and adjusts it as necessary, as well as Node Auto Provisioning, an enhanced version of cluster autoscaling in GKE Standard. In addition to these new GKE Advanced features, Google is adding GKE security features like the GKE Sandbox, which is currently in beta and will come exclusively to GKE Advanced once it’s launched, and the ability to enforce that only signed and verified images are used in the container environment. The Sandbox uses Google’s gVisor container sandbox runtime. With this, every sandbox gets its own user-space kernel, adding an additional layer of security. With Binary Authorization, GKE Advanced users also can ensure that all container images are signed by a trusted authority before they are put into production. Somebody could theoretically still smuggle malicious code into the containers, but this process, which enforces standard container release practices, for example, should ensure that only authorized containers can run in the environment. GKE Advanced also includes support for GKE usage metering, which allows companies to keep tabs on who is using a GKE cluster and charge them according. This feature, too, will be exclusive to GKE Advanced. 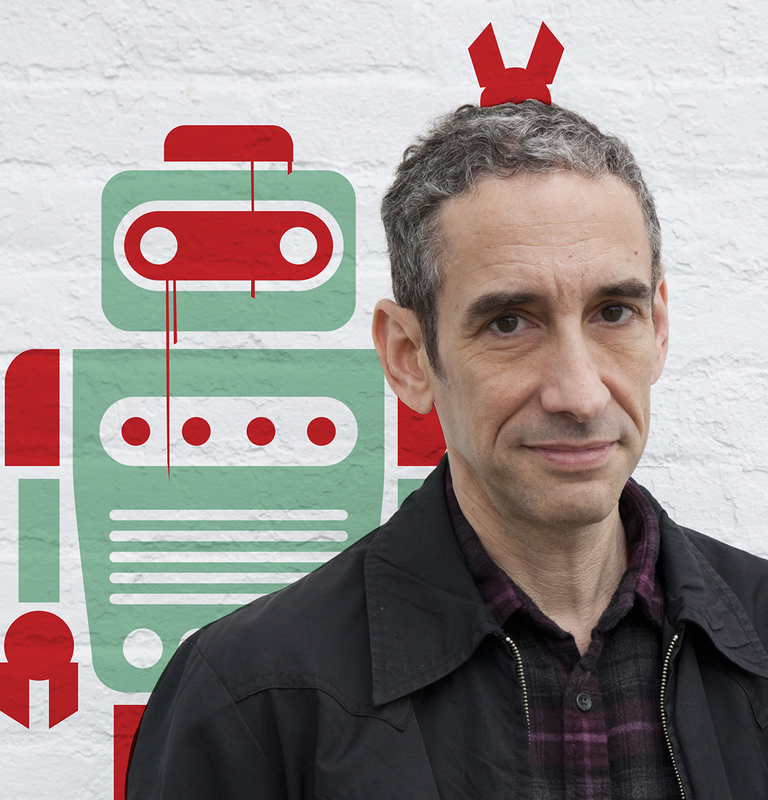 Rushkoff — a prolific writer, broadcaster, and filmmaker once named by MIT as "one of the world's ten leading intellectuals," recently published a new book, Team Human, that certainly would be a strong contender for tech ethics 'book of the year' thus far. Team Human is both an intellectual history of the technologies (including social technologies) of the past millennium or two and an effective rallying cry for humanity at a time when many of us have rightly become far too cynical to stomach most rallying cries on most topics. I don't know if readers of this piece will have a transcendent experience reading it, secular or otherwise, but if you want to spend meaningful time with one of the world's greatest living thinkers on technology and ethics, please proceed below. Greg Epstein: I loved Team Human and I'm excited for TechCrunch readers to learn about it. First, how would you summarize the argument? In February, Twitter confirmed its plans to launch a feature that would allow users to hide replies that they felt didn’t contribute to a conversation. Today, alongside news of other changes to the reporting process and its documentation, Twitter announced the “Hide Replies” feature is set to launch in June. Twitter says the feature will be an “experiment” — which means it could be changed or even scrapped, based on user feedback. The feature is likely to spark some controversy, as it puts the original poster in control of which tweets appear in a conversation thread. This, potentially, could silence dissenting opinions or even fact-checked clarifications. But, on the flip side, it also means that people who enter conversations with plans to troll or make hateful remarks are more likely to see their posts tucked away out of view. In other words, hidden responses aren’t being entirely silenced — just made more difficult to view, as displaying them would require an extra click. Twitter unveiled its plans to launch the “Hide Replies” feature alongside a host of other changes it has in store for its platform, some of which it had previously announced. It says, for example, it will add more notices within Twitter for clarity around tweets that break its rules but are allowed to remain on the site. This is, in part, a response to some users’ complaints around President Trump’s apparently rule-breaking tweets that aren’t taken down. Twitter’s head of legal, policy and trust Vijaya Gadde recently mentioned this change was in the works, in a March interview with The Washington Post. Twitter also says it will update its documentation around its rules to be simpler to understand. And it will make it easier for people to share specifics when reporting tweets so Twitter can act more swiftly when user safety is a concern. This latter change follows a recent controversy over how Twitter handled death threats against Rep. Ilhan Omar. Twitter left the death threats online so law enforcement could investigate, according to a BuzzFeed News report. But the move raised questions as to how Twitter should handle threats against a user’s life in the future. More vaguely, Twitter states it’s improving its technology to help it proactively review content that breaks rules before it’s reported — specifically in the areas of those who dox users (tweet private information), make threats and other online abuse. The company didn’t go in-depth as to how it’s approaching these problems, but it did acquire anti-abuse technology provider Smyte last year, with the goal of better addressing the abuse on its platform. The same technology we use to track spam, platform manipulation and other rule violations is helping us flag abusive Tweets to our team for review. With our focus on reviewing this type of content, we've also expanded our teams in key areas and geographies so we can stay ahead and work quickly to keep people safe. Reports give us valuable context and a strong signal that we should review content, but we've needed to do more and though still early on, this work is showing promise. Twitter also today shared a handful of self-reported metrics that paint a picture of progress. Today, 38 percent of abusive content that’s enforced is handled proactively (note: much content still has no enforcement action taken, though); 16 percent fewer abuse reports after an interaction from an account the reporter doesn’t follow; 100K accounts suspended for returning to create new accounts during Jan.-March 2019, a 45 percent increase from the same time last year; a 60 percent faster response rates to appeals requests through its in-app appeal process, 3x more abusive accounts suspended within 24 hours, compared to the same time last year; and 2.5x more private info removed with its new reporting process compared with the old process. But these are largely “vanity metrics,” as they don’t offer real, hard numbers about the extent of abuse on Twitter. One hundred thousand accounts may have been caught, but how many were not? Three times more abuse accounts suspended — but how many were there? How fast is private info actually taken down? How many people appealed their reports? How many feel the report resolved their problem? How many abuse reports in total are there? Is that number growing or declining? What percent of the user base has used the reporting process because of harassment towards themselves? And so on. Despite Twitter’s attempts to solve issues around online abuse, it still drops the ball in handling what should be straightforward decisions. It’s not necessarily alone here, however. All of social media is at a crossroads, having built platforms that cater to engagement over health and safety; they’re now trying to back pedal furiously ahead of increased regulation. But the problem is that human behavior is what it is. A giant public square will only bring out the worst of us. Twitter is a perfect example. The changes to Twitter were announced as Twitter CEO Jack Dorsey took the stage at TED 2019 on Tuesday, where he admitted the platform's failings in terms of online abuse. The company admits it still has more to do, and will continue to share its progress in the future. According to a report from 9to5mac's Guilherme Rambo, Apple is working on a feature that would let you pair your iPad with your Mac to turn your iPad into a secondary Mac display. That feature, code-named Sidecar, could ship with macOS 10.15 this fall. If you've been using Luna Display or Duet Display, you're already quite familiar with this setup. Those third-party hardware and software solutions let you turn your iPad into an external display. You can then extend your Mac display, move windows to your iPad and use your iPad like an external display. And it sounds like Apple wants to turn those setups into a native feature. It could boost iPad sales for MacBook users, and MacBook sales for iPad users. Apple wants to simplify that feature as much as possible. According to 9to5mac, you would access it from the standard green "maximize" button in the corner of every window. You could hover over that button and send the window to an iPad. By default, apps will be maximized on the iPad and appear as full-screen windows. Maybe you'll be able to send multiple windows and split your display between multiple macOS apps, but that's still unclear. Graphic designers are going to love that feature, as you'll be able to use the Apple Pencil. For instance, you could imagine sending the Photoshop window to your iPad and using your iPad as a Wacom tablet. Sidecar will also be compatible with standard external displays. It should make window management easier, as you'll be able to send windows to another display in just a click. Finally, 9to5mac says that Apple is also working on Windows-like resizing shortcuts — you could drag a window to the side of the screen to resize it to half of the screen, for instance. Lead architect for the PlayStation 4 and PlayStation Vita Mark Cerny gave a lengthy interview to Wired's Peter Rubin and shared some details about Sony's next-gen console — the console that is likely to be called the PlayStation 5. The next PlayStation will be based on an AMD architecture just like the PlayStation 4 and PlayStation 4 Pro. The custom-made CPU will be based on the third-generation AMD Ryzen CPU line. It'll feature eight 7nm cores. As for the GPU, Sony plans to use a custom version of AMD Radeon's Navi GPUs. While AMD is supposed to unveil this new generation of GPUs in the coming months, Cerny says that the next-gen PlayStation GPU will support ray tracing. Those chips should also lead to a jump in audio performance. You can expect better 3D audio support if you have a set of speakers or headphones that support this kind of stuff. The PlayStation 5 will also ship with SSD hard drives by default. This is a key differentiating factor between PC games and console games. Spinning hard drives lead to endless loading screens. Opting for an SSD changes everything. For instance, Cerny says that fast-travel in Spider-Man running on a PlayStation 4 Pro takes approximately 15 seconds, while it takes less than a second on a next-generation PlayStation devkit. On the hardware front, Cerny also said that the PlayStation 5 will have a Blu-ray drive to read physical games. And you'll also be able to play PlayStation 4 games on the new console. Based on the interview, it's unclear whether Sony wants to launch a second-generation PlayStation VR headset. But if you already bought a VR headset, it'll be compatible with the future PlayStation. Sony is skipping E3 this year, which means that we won't hear more about the PlayStation 5 for a while. The company most likely will launch the new console in 2020. Yesterday, Salesforce .com announced its intent to buy its own educational/nonprofit arm, Salesforce.org, for $300 million. On its face, this feels like a confusing turn of events, but industry experts say it’s really about aligning educational and nonprofit verticals across the entire organization. Salesforce has always made a lot of hay about being a responsible capitalist. It’s something it highlights at events and really extends with the 1-1-1 model it created, which gives one percent of profit, time and resources (product) to education and nonprofits. Its employees are given time off and are encouraged to work in the community. Salesforce.org has been the driver behind this, but something drove the company to bring Salesforce.org into the fold. While it’s easy to be cynical about the possible motivations, it could be a simple business reason, says Ray Wang, founder and principal analyst at Constellation Research. As he pointed out, it didn’t make a lot of sense from a business perspective to be running two separate entities with separate executive teams, bookkeeping systems and sales teams. What’s more, he said there was some confusion over lack of alignment and messaging between the Salesforce.com education sales team and what was happening at Salesforce.org. Finally, he says because Salesforce.org couldn’t issue Salesforce.com stock options, it might not have been attracting the best talent. “It allows them to get better people and talent, and it’s also eliminating redundancies with the education vertical. That was really the big driver behind this,” Wang told TechCrunch. Tony Byrne, founder and principal analyst at Real Story Group agreed. “My guess is that they were struggling to align roadmaps between the offerings (.com and .org), and they see .org as more strategic now and want to make sure they’re in the fold,” he said. Brent Leary, principal and co-founder at CRM Essentials, says it’s also about keeping that charitable focus front and center, while pulling that revenue into the Salesforce.com revenue stream. “It seems like doing good is set to be really good for business, making it a potentially very good idea to be included as part of Salesforce’s top line revenue numbers, Leary said. For many, this was simply about keeping up with Microsoft and Google in the nonprofit space, and being part of Salesforce.com makes more sense in terms of competing. “I believe Salesforce’s move to bring Salesforce.org in house was a well-timed strategic move to have greater influence on the company’s endeavors into the Not for Profit (NFP) space. In the wake of Microsoft’s announcements of significantly revamping and adding resources to its Dynamics 365 Nonprofit Accelerator, Salesforce would be well-served to also show greater commitment on their end to helping NFPs acquire greater access to technologies that enable them to carry out their mission,” Daniel Newman, founder and principal analyst at Futurum Research, said. But not everyone sees this move in a positive light. Patrick Moorhead, principal analyst and founder at Moor Insights and Strategies, says it could end up being a public relations nightmare for Salesforce if the general public doesn’t understand the move. Salesforce could exacerbate that perception if it ends up raising prices for nonprofits and education. “Salesforce and Benioff's move with Salesforce.org is a big risk and could blow up in its face. The degree of negative reaction will be dependent on how large the price hikes are and how much earnings get diluted. We won't know that until more details are released,” Moorhead said. The deal is still in progress, and will take some months to close, but if it’s simply an administrative move designed to create greater efficiencies, it could make sense. The real question that remains is how this will affect educational and nonprofit institutions as the company combines Salesforce.org and Salesforce.com. Salesforce did not wish to comment for this story. You are subscribed to email updates from TechCrunch.